HAPPY AND BLESSED NEW YEAR 2014 TO ONE AND ALL! 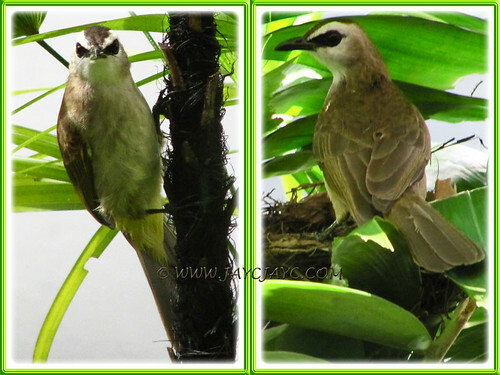 Our first post for 2014 is dedicated to the White-browed Bulbuls (Pycnonotus luteolus) Yellow-vented Bulbul (Pycnonotus goiavier)… they have given us so much joy and blessed anticipation since last Christmas. January 3 – What a marvelous and exciting start of 2014 with a bang…. 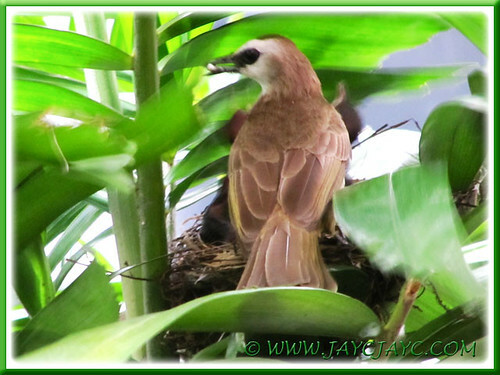 the arrival of feathered babies on the third morning of the New Year! 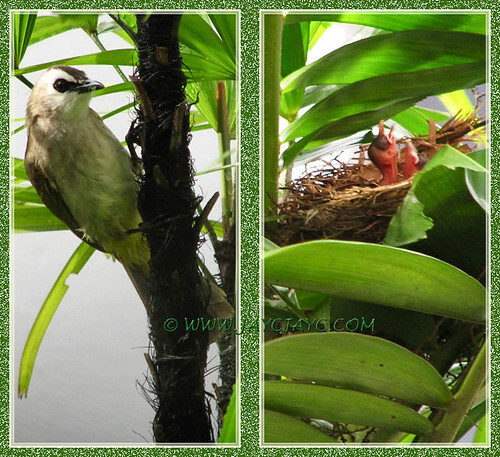 How blessed to witness once again the Bulbuls’ breeding process unfolding at our backyard, almost at our doorstep. Since we’ve experienced before their successful breeding in 2008, we managed to guess when the babies would be born. 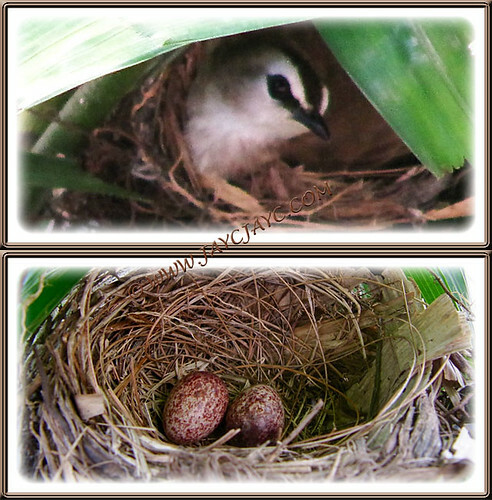 It was spot-on… they greeted the world exactly nine days after we first found a clutch of two beautifully spotted eggs in the nest, hidden atop our potted Macarthur Palm on Boxing Day, December 26 2013! January 4 – However, something terrible happened the next morning that had me in tears. My beloved John shouted out that one of the hatchlings had fallen onto the dustpan below. Gosh an 8-ft drop… no way it’d live! 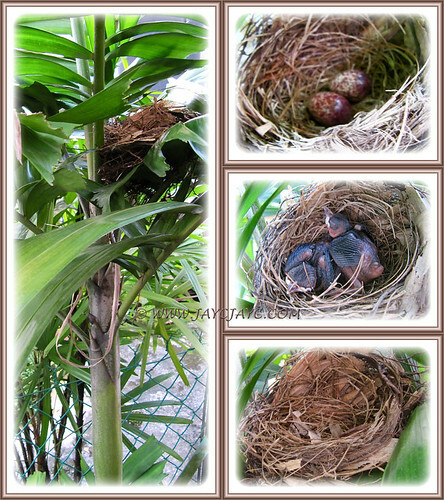 Nevertheless, hubby returned it into the nest pronto and we prayed for the best. About six hours later when I scrutinized a shot taken then and saw both siblings seeking food with mouths wide-opened, tears of joy streamed down my cheeks and I thank The Almighty for its miraculous survival (it reminded me of the Gospel text of Matthew 6:26 – “Look at the birds of the air, for they neither sow nor reap nor gather into barns; yet your heavenly Father feeds them. Are you not of more value than they?”). January 5 to 9 – Yay… I’m on cloud nine! 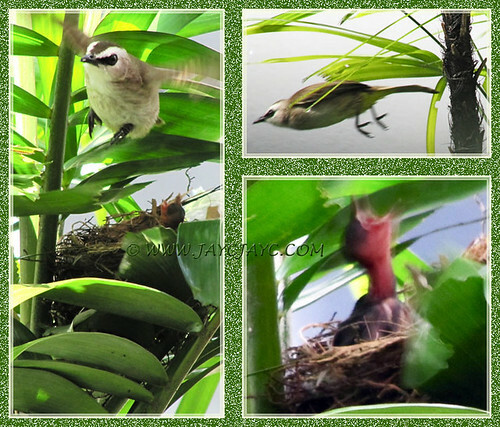 Just couldn’t get enough of seeing the parents and their brood in our concrete jungle! My excitement and amazement is simply indescribable. I’m overwhelmed with wonder and feeling so thankful and grateful for these blessed happenings. So close… just about 2 meters away, I’ll peep through our kitchen glass-window louvers ever so often to enjoy the goings-on outside and try to capture them with my camera. Not an easy task at all. Though the birds love to nest so close to humans, they’re so wary of us… taking off at any slightest sign of us watching. Hahahah… and with the camera lens zoomed out, they surely are scared stiff of being shot dead! They’re brainy fellas too… not minding at all our beloved pet dog, Maxi at the backyard barking his head off at stray cats. Hehee… they seem to know that our 4-legged friend can’t get any higher to reach them! So wonderful to observe that both the male and female bird work closely together to brood, feed and watch over their babies. Weather hadn’t been kind with frequent rainfall for the past ten days. 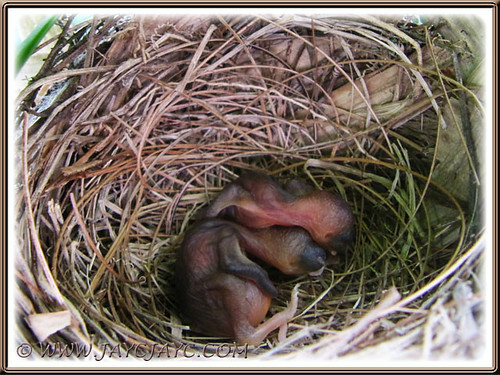 I fear for these tiny nestlings but their ever watchful parents know best on how to keep them warm and protected. 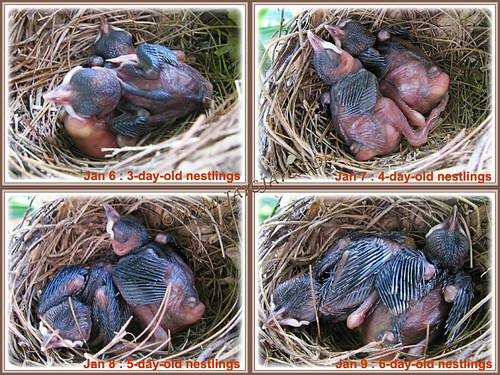 Several days passed-by pleasingly and it was wonderful to observe from photos captured daily that the nestlings were growing beautifully, no longer naked but covered randomly with feathers. 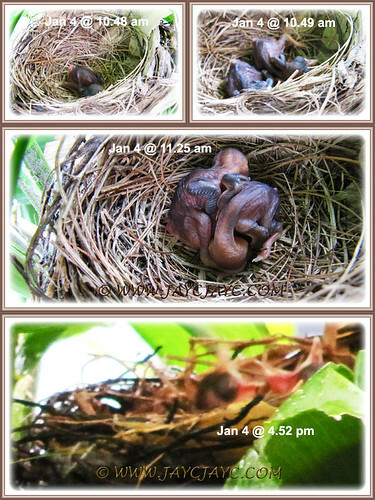 I was surprised to note that their eyes remained unopened even up to Day 6 or were my captures ill-timed, I wondered? January 10 – Cold wet weather on Day 7 persisted with rainfall from morning till late evening, preventing me from venturing outside to the backyard. I had to be contented to just watch the parents’ activities occasionally through the kitchen window shutters. Around 5 pm when the rain ceased, I went out to get a shot of the nestlings and couldn’t believe what I saw… only one nestling was inside. What an awful, shocking discovery that momentarily stunned me speechless and made me cry. We searched around our backyard, inside and out but couldn’t find any trace of the missing baby. 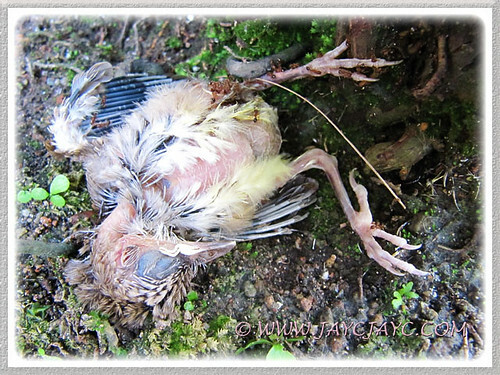 Probably, fallen from the nest and devoured by a rat, squirrel or cat that often prowl behind. Could have happened in the early morning as I recalled one of the parents making much noise persistently (about 5-10 minutes) nearby, on the overhead telephone cable. We thought nothing of that continuous agitated call since its mate was sitting on the nest. Come to think of it, the parent could have been mourning and crying for its loss. So sad! Jauary 11 – Well, life has to go on…. 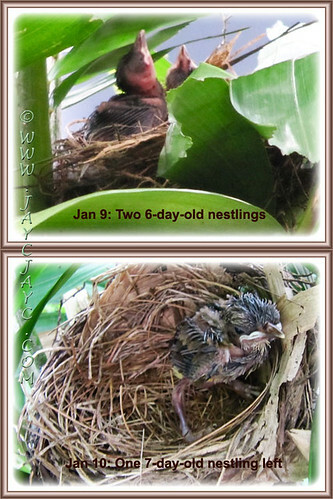 The parents continued their loving and caring duties on Day 8 to the remaining nestling, looking so lonely and lost. 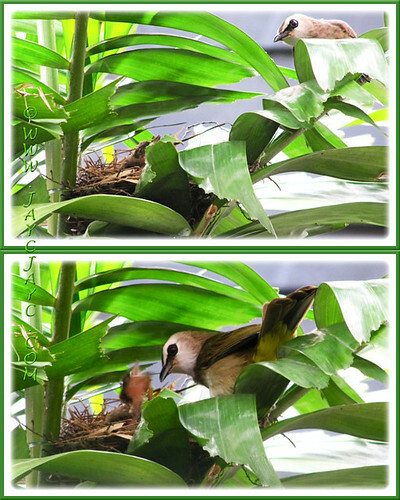 Feeding occasions are much more frequent now. It is almost completed covered with feathers, eyes have opened, and it’s getting bigger and stronger and preparing to fledge soon. Hope all will be well for both the parents and the only surviving baby. 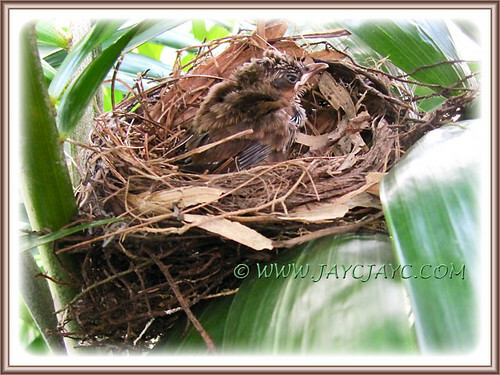 Pray that the nestling will fledge in a couple of days as its growth into a healthy and strong birdie gain momentum. but couldn’t finish it in time. Thus mission aborted! Tragedy struck without warning! Our hopes, well-wishes and prayers for the parents and their baby nestling were shattered. What a disaster… so very sad, depressing and unfortunate. Farewell, my little one and your other sibling too that went before you… RIP! Joy and sorrow are different sides of the same coin called life… they go hand in hand! If we accept happiness, we must also accept pain. On the whole, I’m delighted to have been able to get many shots added to my photo library, enabling us to enjoy these remarkable events as and when desire, as well as to share them online. We praise and thank God for this priceless and exceptional encounter, up-close with nature! We feel so blessed, joyful, thankful and grateful to have been able to witness this marvelous, yet tragic event… from eggs to empty nest eventually! What a sorrowful finale for the despairing parents… truly empathize with their grief. Hope you’ve at least enjoyed the photos, not the sorrow though! Its truly a joy and sorrow moment when I saw the last one had a dropped and died. next time these birds decide to lay its egg again.